, a learned English divine, and the. founder of St. Paul’s school, was born in the parish of St. Antholin, London, in 1466, and was the eldest son of sir Henry Colet, knt. twice lord-mayor, who had besides him twenty-one children. In 1483 he was sent to Magdalen college in Oxford, where he spent seven years in the study of logic and philosophy, and took the degrees in arts. He was perfectly acquainted with Cicero’s works, and no stranger to Plato and Plotinus, whom he read together, that they might illustrate each other. He could, hcfwever, read them only in the Latin translations; for neither at school nor university had he any opportunity of learning the Greek, that language being then thought unnecessary, and even discouraged. 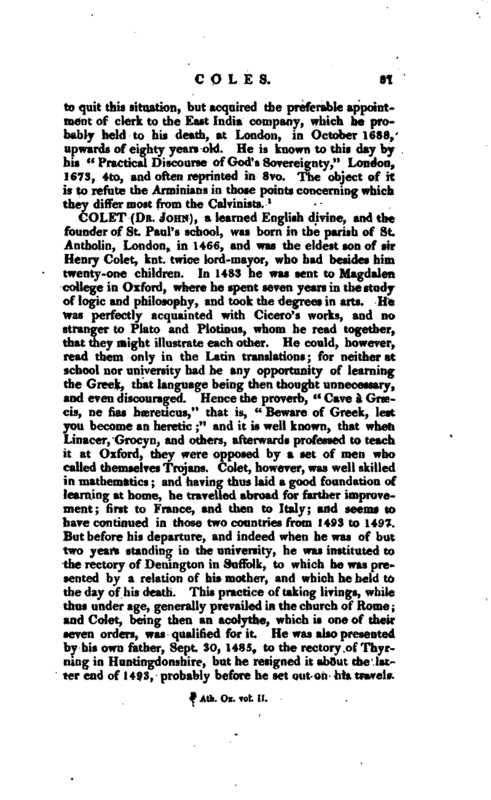 Hence the proverb, “Cave a Graecis, ne lias haereticus,” that is, “Beware of Greek, lest you become an heretic;” and it is well known, that when Linacer, Grocyn, and others, afterwards professed to teach it at Oxford, they were opposed by a set of men who called themselves Trojans. Colet, however, was well skilled in mathematics; and having thus laid a good foundation of learning at home, he travelled abroad for farther improvement first to France, and then to Italy; and seems to have continued in those two countries from 1493 to 1497. But before his departure, and indeed when he was of but two years standing in the university, he was instituted to the rectory of Denington in Suffolk, to which he was presented by a relation of his mother, and which he held to the day of his death. This practice of taking livings, while thus under age, generally prevailed in the church of Rome; and Colet, being then an acolythe, which is one of their seven orders, was qualitied for it. He was also presented by his own father, Sept. 30, 1485, to the rectory of Thyrning in Huntingdonshire, but he resigned it about the latter end of 1493, probably before he set out on his travels. | Being arrived at Paris, he soon became^ acquainted with the learned there, with the celebrated Budaeus in particular; and was afterwards introduced to Erasmus. In Italy he contracted a friendship with several eminent persons, especially with his own countrymen, Grocyn, Linacer, Lilly, and Latimer; who were learning the Greek tongue, then but little known in England, under those great masters Demetrius, Angel us Politianus, Hermolaus Barbarus, and Pomponius Sabinus. He took this opportunity of improving himself in this language; and having devoted himself to divinity, he read, while abroad, the best of the antient fathers, particularly Origen, Cyprian, Ambrose, and Jerome, but, it is said, very much undervalued St. Augustine. 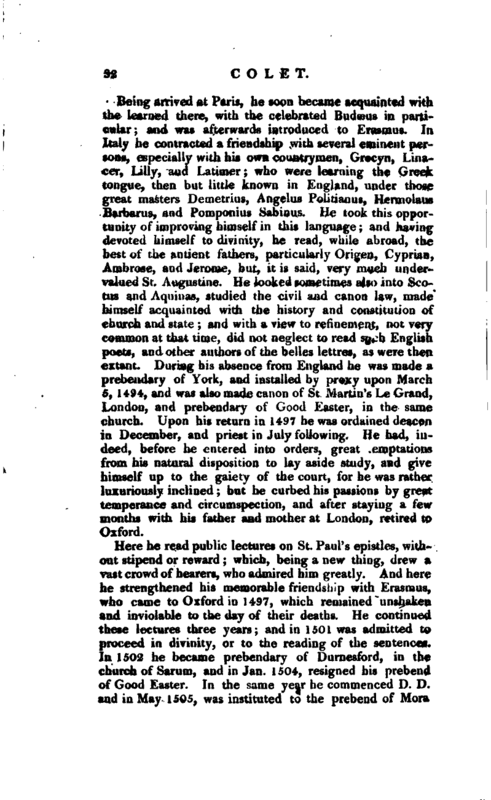 He looked sometimes also into Sco^ tus and Aquinas, studied the civil and canon law, made himself acquainted with the history and constitution of church and state; and with a view to refinement, not very common at that time, did not neglect to read such English poets, and other authors of the belles lettres, as were then extant. During his absence from England he was made a prebendary of York, and installed by proxy upon March 5, 1494, and was also made canon of St. Martin’s Le Grand, London, and prebendary of Good Easter, in the same church. Upon his return in 1497 he was ordained deacon in December, and priest in July following. 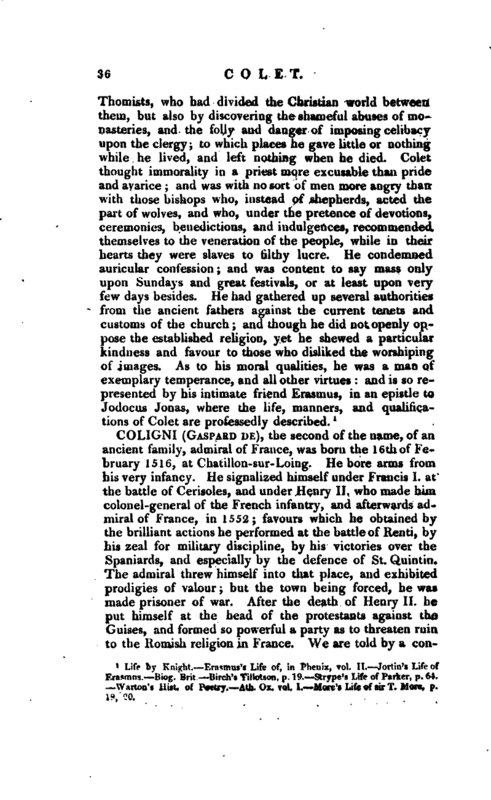 He had, indeed, before he entered into orders, great temptations from his natural disposition to lay aside study, and give himself up to the gaiety of the court, for he was rather luxuriously inclined; but he curbed his passions by great temperance and circumspection, and after staying a few months with his father and mother at London, retired to Oxford. Here he read public lectures on St. Paul’s epistles, without stipend or reward; which, being a new thing, drew a vast crowd of hearers, who admired him greatly. And here he strengthened his memorable friendship with Erasmus, who came to Oxford in 1497, which remained unshaken and inviolable to the day of their deaths. He continued these lectures three years; and in 1501 was admitted to proceed in divinity, or to the reading of the sentences. In 1502 he became prebendary of Durnesford, in the churcfa of Sarum, and in Jan. 1504, resigned his prebend of Good Easter. 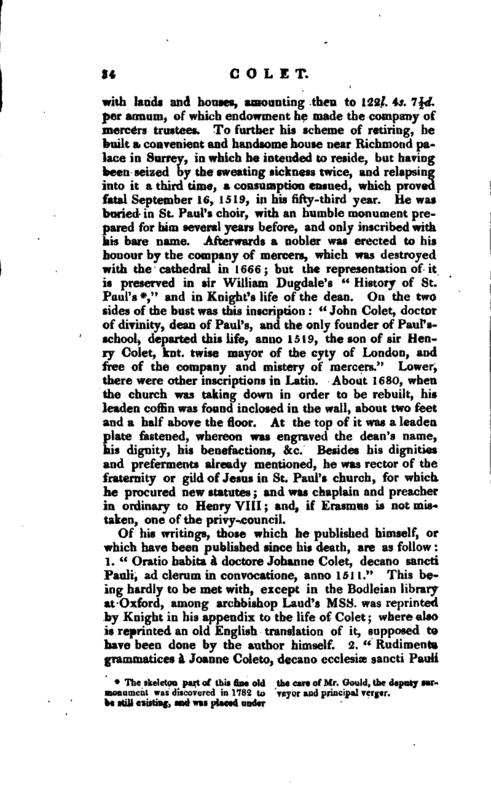 In the same year he commenced D. D. and in May 1505, was instituted to the prebend of Mora | in St. Paul’s, London. The same year and month he was made dean of that church, without the least application of his own; and being raised to this high station, he began to reform the decayed discipline of his cathedral. He introduced a new practice of preaching himself upon Sundays and great festivals, and called to his assistance other learned persons, such as Grocyn, and Sowle, whom he appointed to read divinity-lectures. These lectures raised in the nation a spirit of inquiry after the holy scriptures, which had long been laid aside for the school divinity; and eventually prepared for the reformation, which soon after ensued. Colet was unquestionably in some measure instrumental towards it, though he did not live to see it effected; for he expressed a great contempt of religious houses, exposed the abuses that prevailed in them, and set forth the danger of imposing celibacy on the clergy. 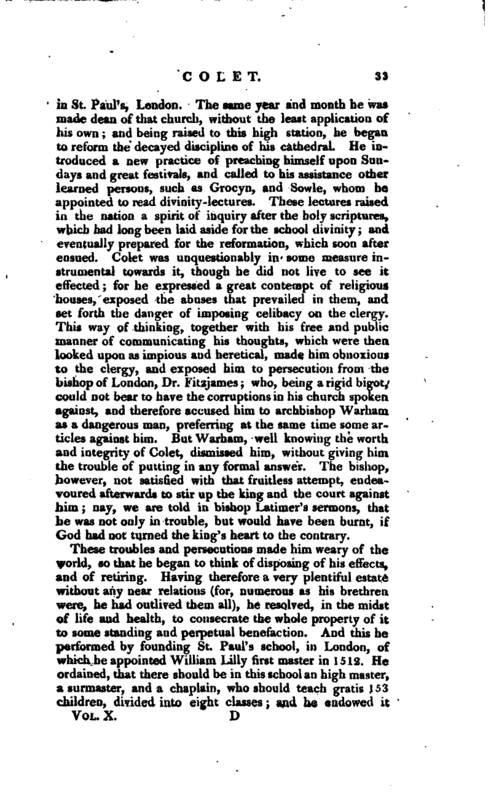 This way of thinking, together with his free and public manner of communicating his thoughts, which were then looked upon as impious and heretical, made him obnoxious to the clergy, and exposed him to persecution from the bishop of London, Dr. Fitzjames; who, being a rigid bigot, could not bear to have the corruptions in his church spoken against, and therefore accused him to archbishop Warham as a dangerous man, preferring at the same time some articles against him. But Warham, well knowing the worth and integrity of Colet, dismissed him, without giving him the trouble of putting in any formal answer. The bishop, however, not satisfied with that fruitless attempt, endeavoured afterwards to stir up the king and the court against him; nay, we are told in bishop Latimer’s sermons, that he was not only in trouble, but would have been burnt, if God had not turned the king’s heart to the contrary. These troubles and persecutions made him weary of the world, so that he began to think of disposing of his effects, and of retiring. Having therefore a very plentiful estate without any near relations (for, numerous as his brethren were, he had outlived them all), he resolved, in the midst of life and health, to consecrate the whole property of it to some standing and perpetual benefaction. And this he performed by founding St. Paul’s school, in London, of which he appointed William Lilly first master in 1512. He ordained, that there should be in this school an high master, a surmaster, and a chaplain, who should teach gratis 153 children, divided into eight classes and he endowed it | with lands and houses, amounting then to 122l. 4s. 7½d per annum, of which endowment he made the company of mercers trustees. To further his scheme of retiring, he built a convenient and handsome house near Richmond palace in Surrey, in which he intended to reside, but having been seized by the sweating sickness twice, and relapsing into it a third time, a consumption ensued, which proved fatal September 16, 1519, in his fifty-third year. He was buried in St. Paul’s choir, with an humble monument prepared for him several years before, and only inscribed with his bare name. Afterwards a nobler was erected to his honour by the company of mercers, which was destroyed with the cathedral in 1666; but the representation of it is preserved in sir William Dugdale’s “History of St. Paul’s*,” and in Knight’s life of the dean. On the two sides of the bust was this inscription: “John Colet, doctor of divinity, dean of Paul’s, and the only founder of Paul’sschocrf, departed this life, anno 1519, the son of sir Henry Colet, knt. twise mayor of the cyty of London, and free of the company and mistery of mercers.” Lower, there were other inscriptions in Latin. About 1680, when the church was taking down in order to be rebuilt, his leaden coffin was found inclosed in the wall, about two feet and a half above the floor. At the top of it was a leaden plate fastened, whereon was engraved the dean’s name, his dignity, his benefactions, &c. Besides his dignities and preferments already mentioned, he was rector of the fraternity or gild of Jesus in St. Paul’s church, for which he procured new statutes; and was chaplain and preacher in ordinary-to Henry VIII; and, if Erasmus is not mistaken, one of the privy-council. The skeleton part of this fine old monument was discovered in 1782 to be still existing, and was placed under the care of Mr. Gould, the deputy surveyor and principal verger. | Londin. in usum scholae ab ipso institutae:” commonly called “Paul’s Accidence, 1539,” 8vo. 3. “The construction of the eight parts of speech, entitled Absolutissimus de octo orationis partium constructione libellus:” which, with some alterations, and great additions, makes up the syntax in Lilly’s grammar, Antwerp, 1530, 8vo. 4. “Daily Devotions or, the Christian’s morning and evening sacrifice.” This is said not to be all of his composition. 5. “Monition to a godly Life,” 1534, 1563, &c. 6. “Epistolae ad Erasmum.” Many of them are printed among Erasmus’s epistles, and some at the end of Knight’s Life of Colet. There are still remaining in ms. others of his pieces, enumerated in the account of his Life by Knight. 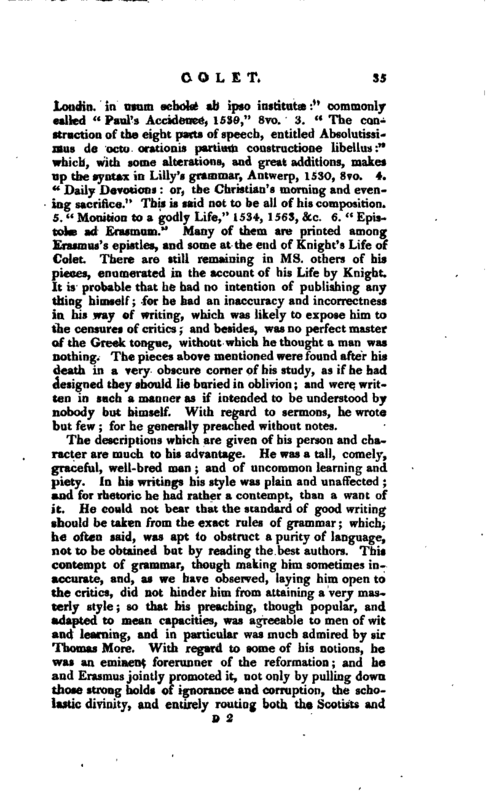 It is probable that he had no intention of publishing any thing himself; for he had an inaccuracy and incorrectness in his way of writing, which was likely to expose him to the censures of critics; and besides, was no perfect master of the Greek tongue, without which he thought a man was nothing. The pieces above mentioned were found after his death in a very obscure corner of his study, as if he had designed they should lie buried in oblivion; and were written in such a manner as if intended to be understood by nobody but himself. With regard to sermons, he wrote but few; for he generally preached without notes. Life by Knight.—Erasmus’s Life of, in Phenix, vol. II.—Jortin’s Life of Erasmus.—Biog. Brit.—Birch’s Tillotson, p. 19.—Strype’s Life of Parker, p. 64. —Warton’s Hist. of Poetry.—Ath. Ox. vol. I.—More’s Life of sir T. More, p. 19, 20.